Elon Musk has set aside $US15 million for an XPRIZE contest for entrepreneurs who can find the most effective way to use software to teach illiterate children living in extreme poverty. 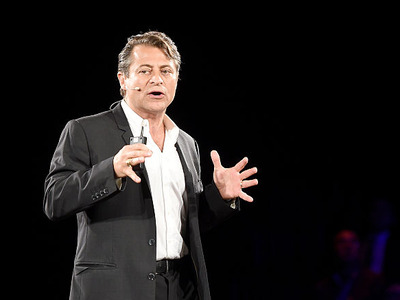 Peter Diamandis is the founder of XPRIZE, which is built on the idea that inspiring business competition is one of the most effective ways to fuel societal progress. Diamandis believes that rapid technological progress will benefit everyone over the next few decades, not just the top of the upper class. This post is part of Business Insider’s ongoing series on Better Capitalism. One of the greatest insights Peter Diamandis ever had was that one of the best ways to inspire people to create societal progress is through a contest with a cash prize. Michael Buckner/Getty ImagesPeter Diamandis believes that competition among entrepreneurs is one of the most efficient ways to solve society’s biggest challenges. It was 1993 and he was reading Charles A. Lindbergh’s autobiography “The Spirit of St. Louis” during a visit to his parents’ house. He learned that Lindbergh was motivated to become the first aviator to cross the Atlantic by a $US25,000 prize. “And Lindbergh, the most unlikely guy, pulls it off and becomes massively famous – and opens up aviation, more importantly,” Diamandis said. It inspired him to set out on a journey to inspire a similar path to launching the first private manned flight into space, a feat he saw realised in 2004. Since then, the XPRIZE Foundation has had seven successful contests and eight current ones, inspiring several businesses to tackle “moonshots” that companies would otherwise find too risky to be worth the attempt. In 2014, 700 teams submitted their plans for developing Android applications for tablets that could provide children living in extreme poverty with clear lessons on how to read, write, and do basic maths. The XPRIZE team selected five semifinalists and gave them each $US1 million to pursue their plan and test it in communities in Tanzania. Google provided 800 tablets for the initiative. XPRIZE/YouTubeMusk’s XPRIZE competition is for developing learning software for children living in extreme poverty in Tanzania. The winner will win $US10 million to scale its program, and all semifinalists will be open sourced, available to any developers who want to build off them. XPRIZE has stated that it intends to help the winner reach 250 million children around the world with its winning software. He said the predicted commercialization of what he and Musk are doing with the Global Learning XPRIZE will be more beneficial than pure charity, in a way. “These devices, these tablets, will eventually be free. Because someone will want their data, or will want you to buy on their Amazon device,” he said.